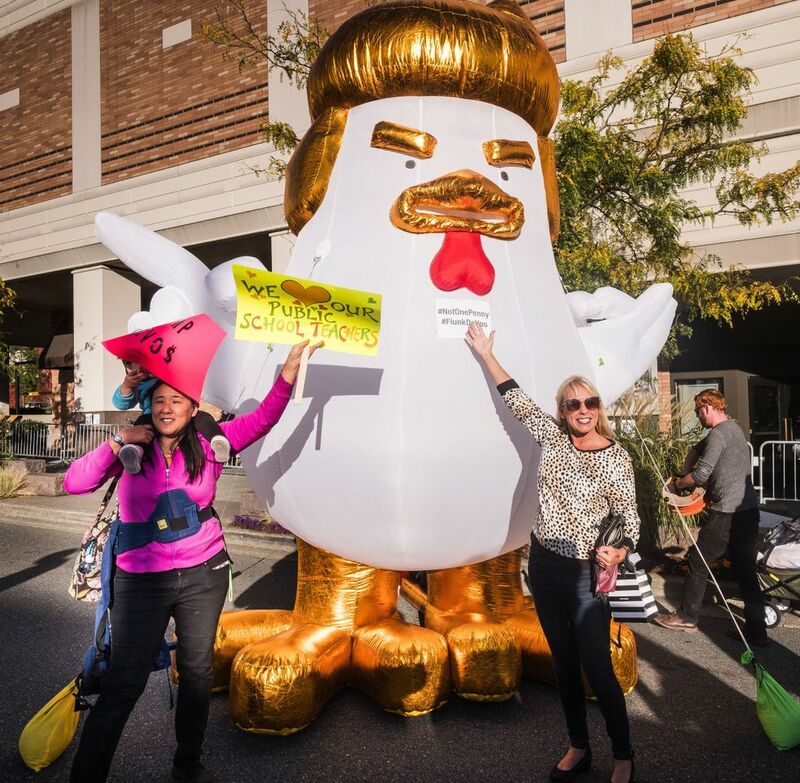 Hundreds of people gathered in downtown Bellevue Friday evening to protest her visit. During her speech at the Hyatt Regency, DeVos didn't stray much from her prepared remarks. 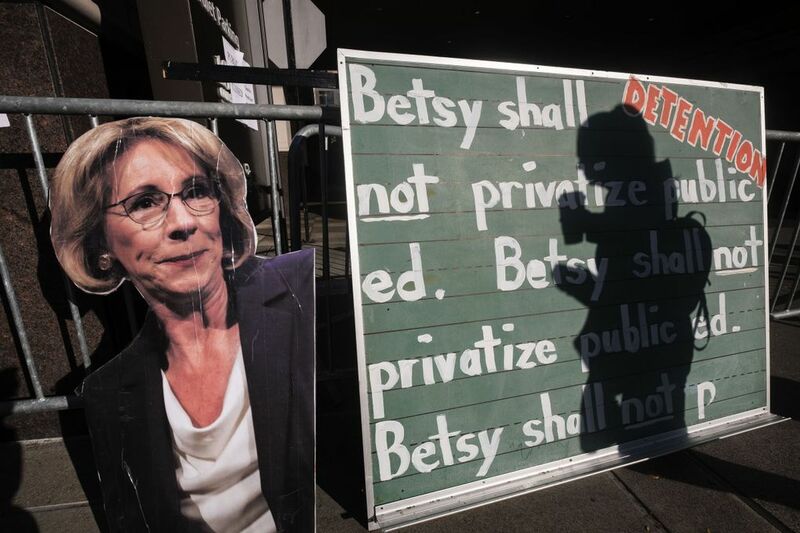 This feed of updates from U.S. Education Secretary Betsy DeVos’ appearance in Bellevue is now closed. 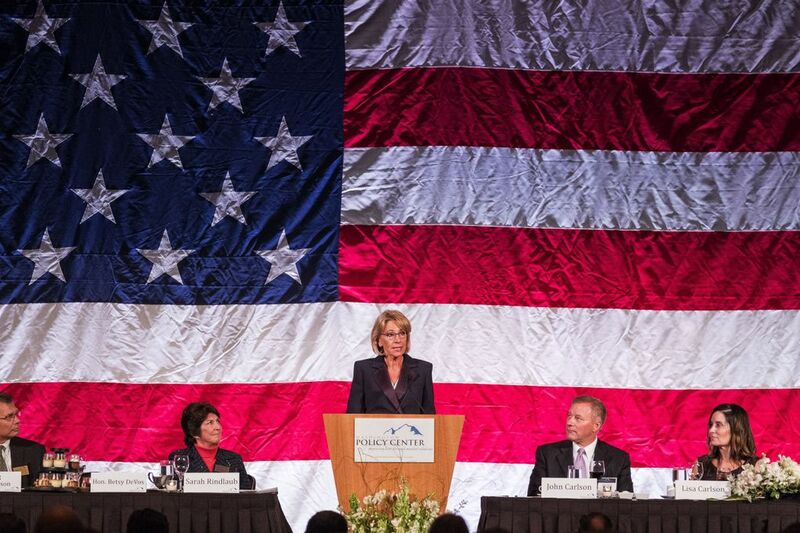 U.S. Department of Education Secretary Betsy DeVos was the keynote speaker at the Washington Policy Center’s sold-out gala Friday at the Hyatt Regency in Bellevue. You can read a copy of her prepared remarks here. A crowd of hundreds gathered outside the hotel for a protest against DeVos’ views. A pro-DeVos counterprotest was planned as well. 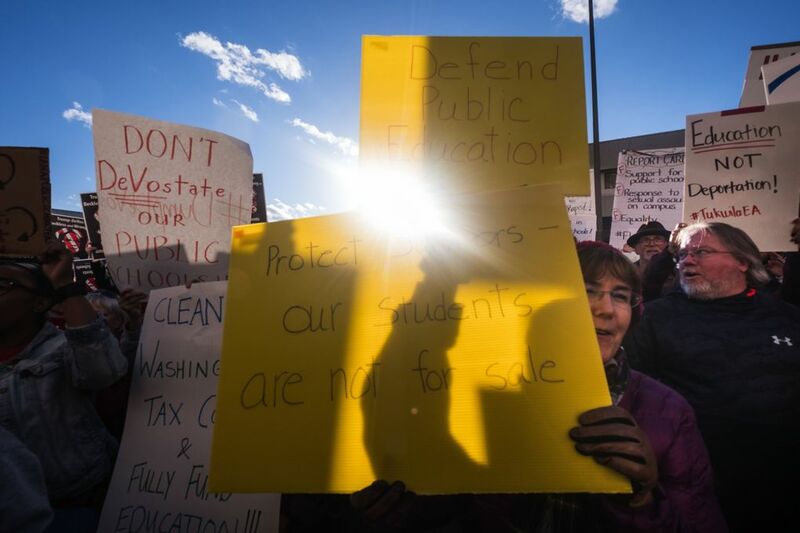 Organizers of the anti-DeVos rally hoped it would be one of the largest DeVos protests yet. Fox News anchor Neil Cavuto also spoke at the gala. 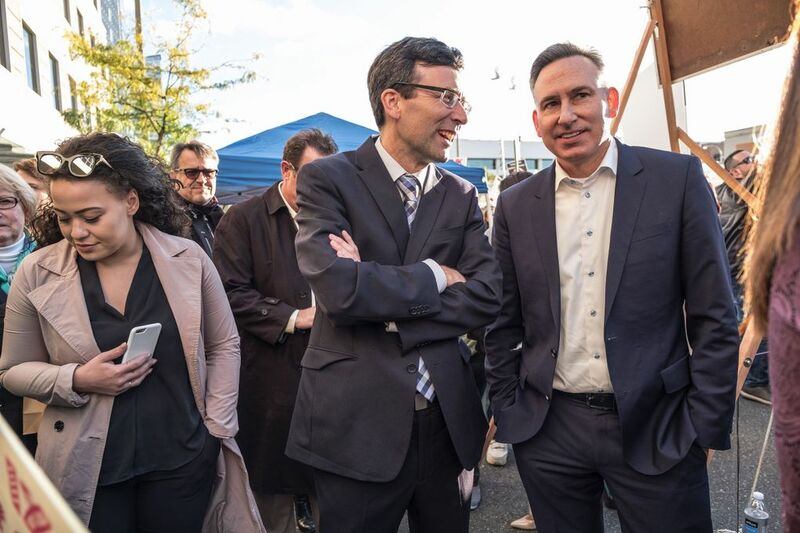 At the protest outside the hotel, Attorney General Bob Ferguson, King County Executive Dow Constantine, Bellevue Mayor John Stokes and others rallied the crowd. 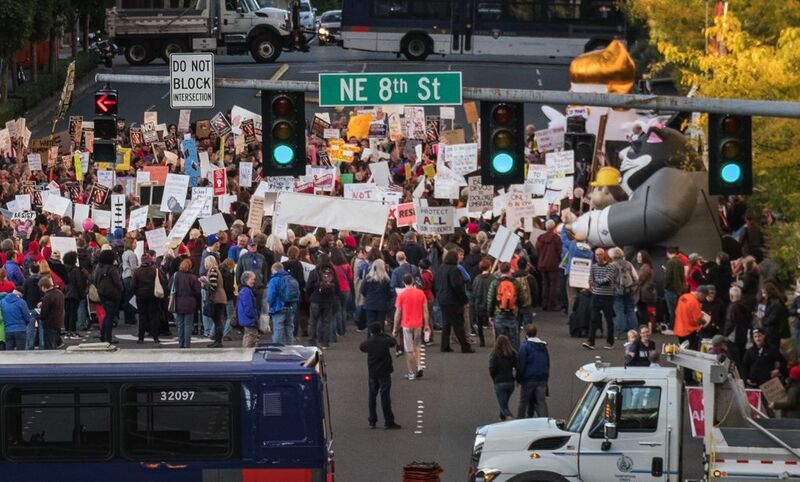 Bellevue Way Northeast, from Northeast Eighth Street to Northeast 10th Street, will be closed in both directions from 4 p.m. to 8:30 p.m., because of the protests. 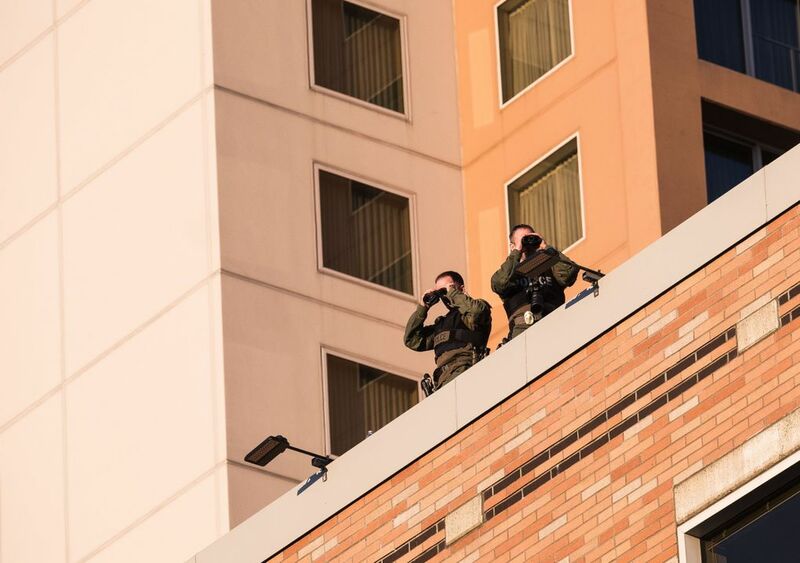 The Bellevue Police Department said extra officers will be on duty during the event. DeVos didn’t stray much from her prepared remarks, but one passage that received a more enthusiastic round of applause came just before she concluded. 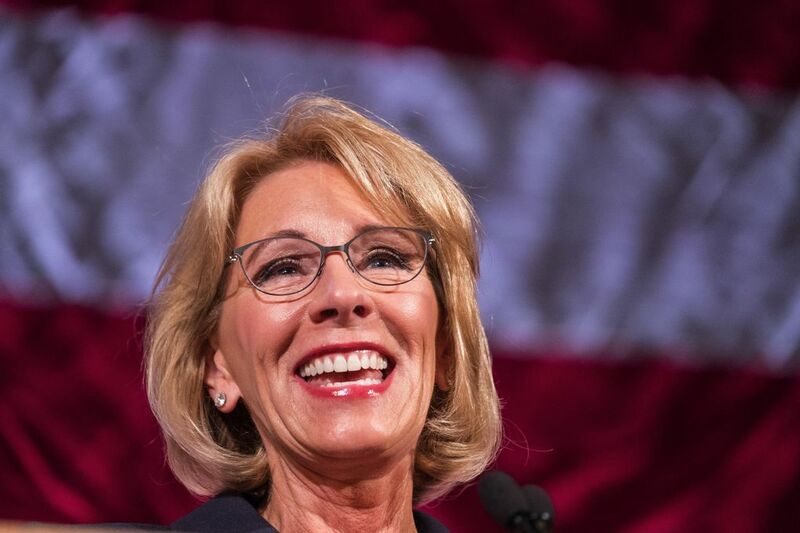 “We owe it to America’s students to rethink school because they deserve a better education and a chance at a better life,” she said. After her remarks to the main audience, DeVos made a brief and unannounced appearance at a separate dinner for young professionals. 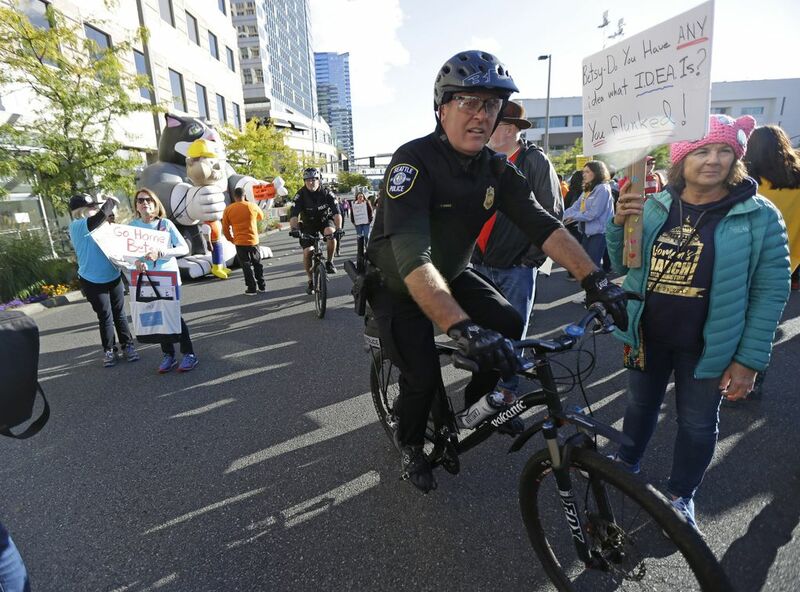 Inside the event, Tacoma parent Ami Lara introduced DeVos to a standing ovation but before the ceremony shared a message for the protesters outside. 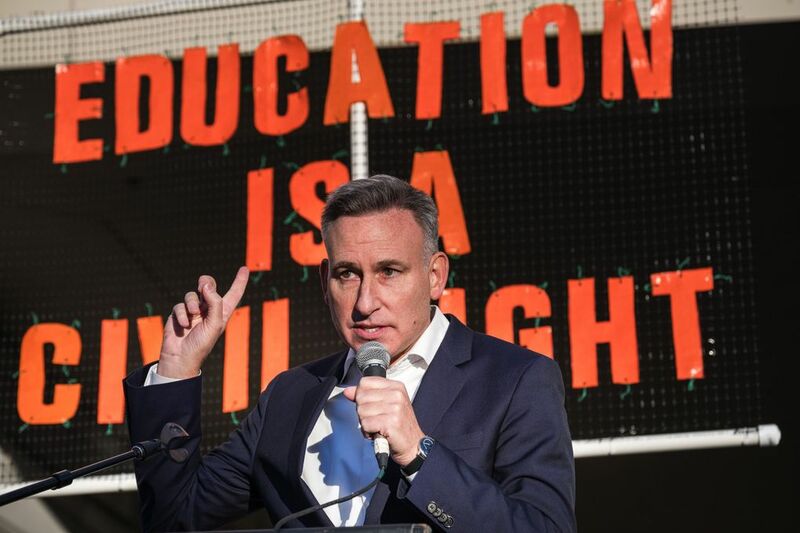 “Public schools are great for a lot of students. They weren’t for my child,” Lara said. 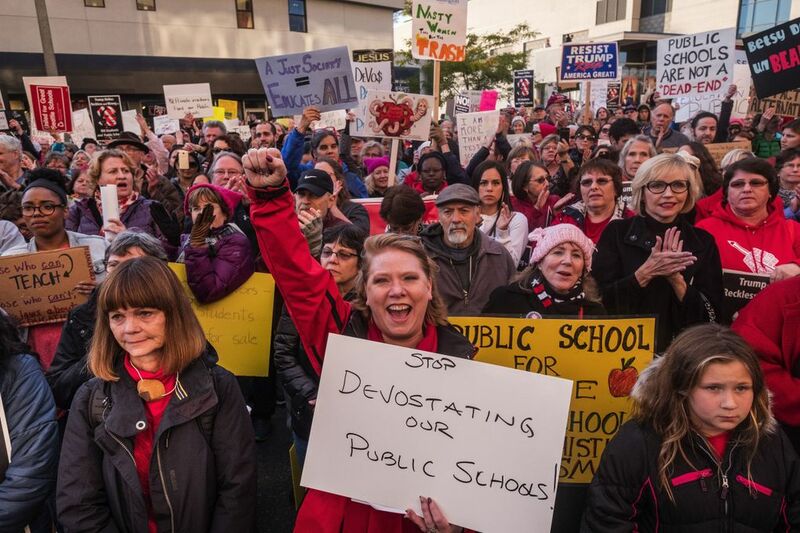 A daughter and granddaughter of public school teachers, Lara said it was hard to watch her own daughter, Dorah, struggle in a traditional elementary school in Tacoma. So when Dorah started the sixth-grade, Lara transferred her to the charter Destiny Middle School — where Dorah said the small class sizes and one-on-one attention from teachers have helped her thrive. “The first day I wasn’t excited … That changed 100 percent,” Dorah said. Dorah’s transformation at Destiny convinced Lara to join other parents in lobbying the Legislature last year to pass its recent charter-school bill. And, with her hand on Dorah’s shoulder, Lara dismissed the concern that charter schools do not accept special education students, like her own. The crowd of people denouncing DeVos’ leadership is shrinking. More than an hour before DeVos’ keynote speech, the U.S. Department of Education has released what she will say. You can find the Education Secretary’s prepared remarks here. About 1,500 people will be inside the Hyatt Regency for DeVos’ appearance at the Washington Policy Center’s annual gala, where the minimum ticket price is $350. 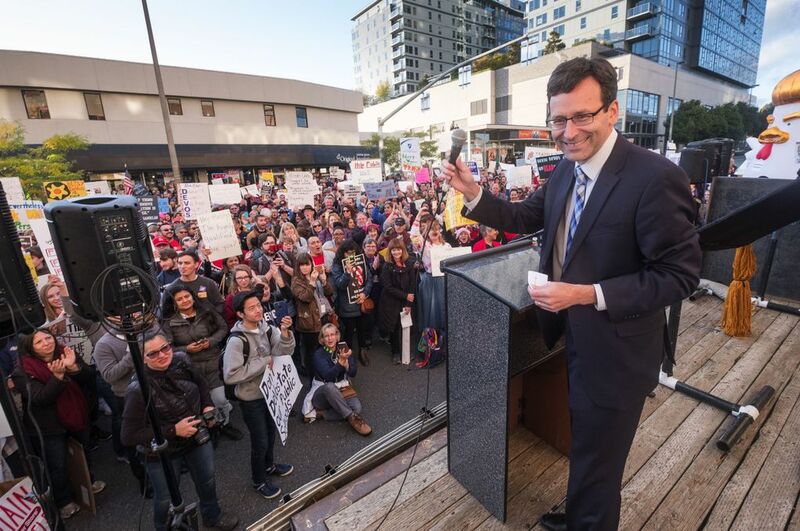 Education leaders and elected officials, including Attorney General Bob Ferguson and King County Executive Dow Constantine, rallied the crowd of protesters. We are live streaming the rally on Facebook. 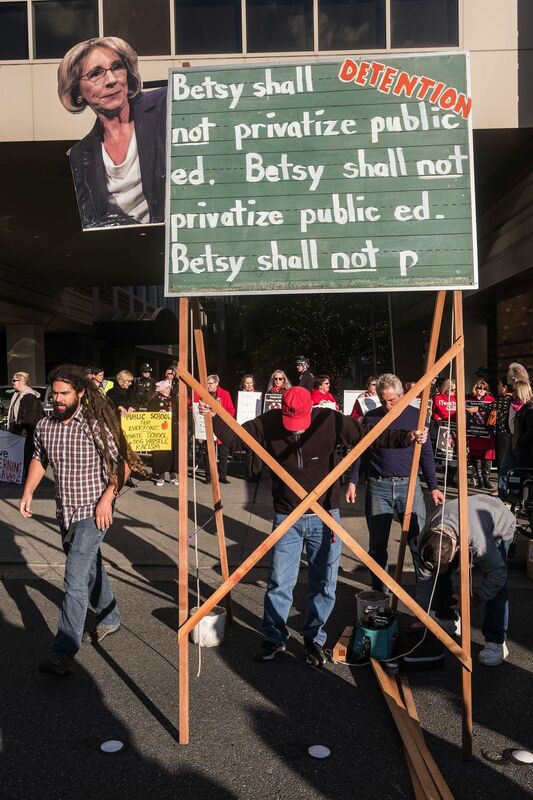 Hundreds of people are chanting and holding signs outside the Hyatt Regency to show their opposition toward the Education Secretary. 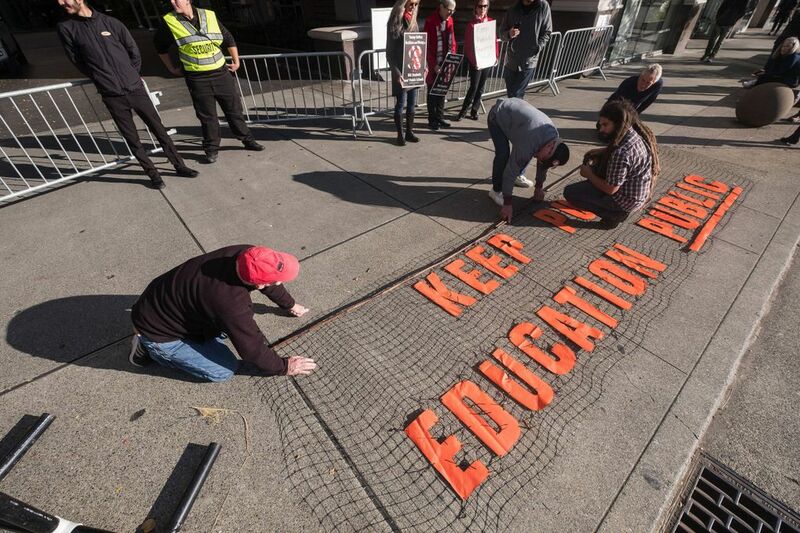 Sharonne Navas, an organizer with the Equity in Education Coalition, said the protest helped unify groups of educators and public-education advocates who may not have otherwise come together. 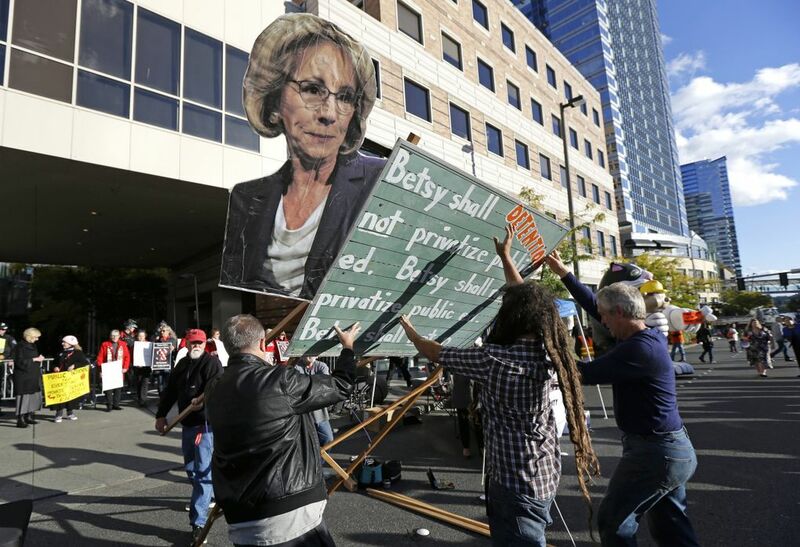 She said DeVos personifies what they have been fighting against: A billionaire who has no experience in public education but wants to change policies. 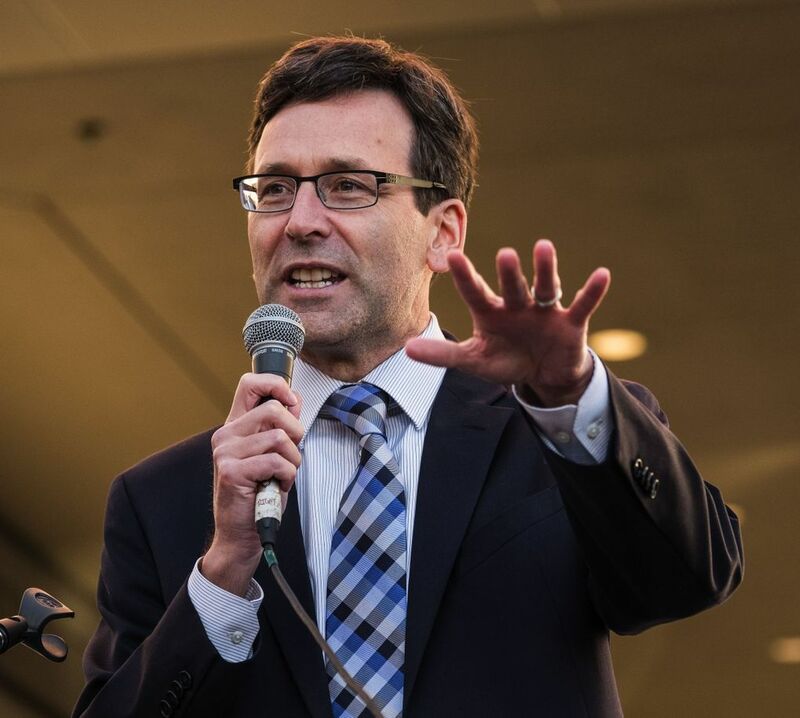 “This is the outcry Washington has been waiting for,” she said. Among the crowd is Marie Cousey, a retired education who worked in schools in Auburn, Boston and California. She said she attended private schools as a child. But she did not support allowing parents to use public money to pay for private school tuition. 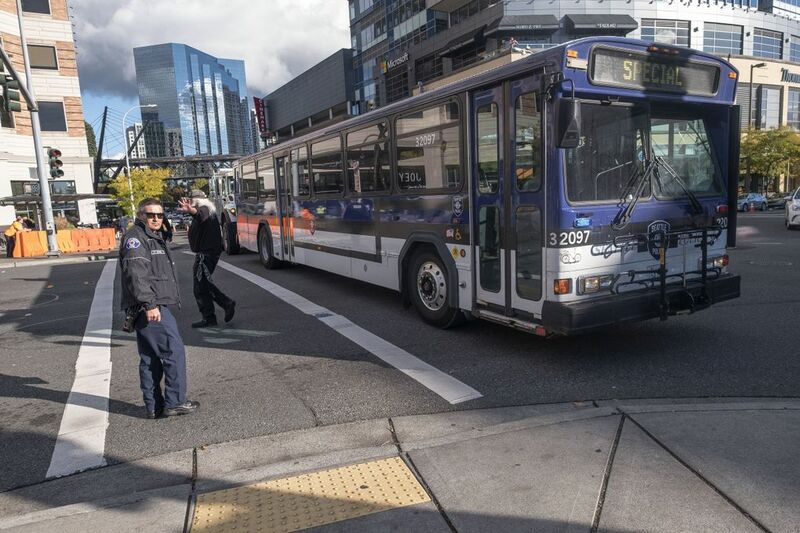 “It’ll just spread the resources too thin,” Cousey said. Brooke Bennett, a 16-year-old junior at Bellevue High, came to the rally with a sign mocking DeVos for her comments at her confirmation hearing that guns in schools could help protect students from bear attacks. “I’m here to support my teachers, she said. Bennett said she is also concerned by DeVos’ attempts to roll back Obama-led policies on how colleges and universities deal with sexual assault. 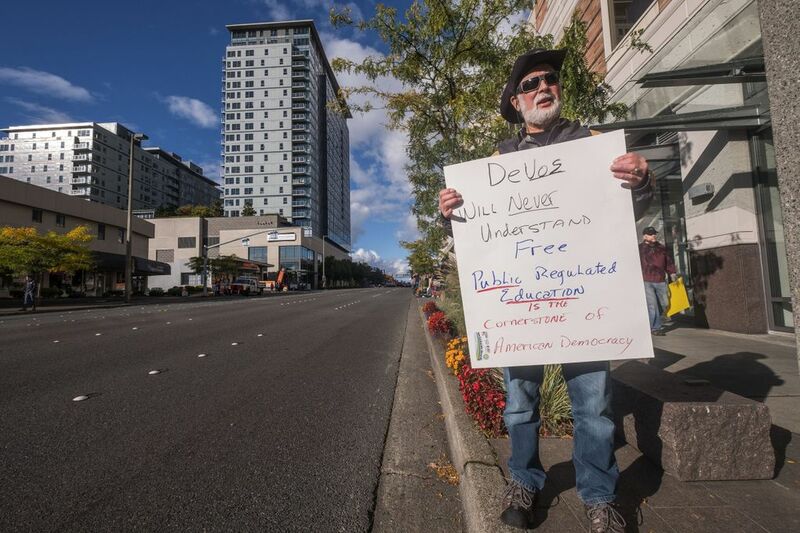 The number of people gathering in downtown Bellevue to protest the Education Secretary’s visit is growing. 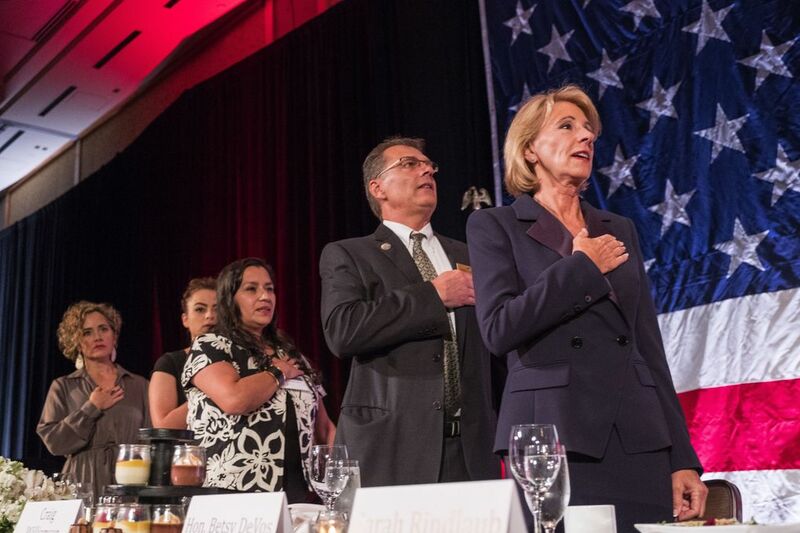 DeVos is scheduled to speak at the Washington Policy Center’s annual gala at 7 p.m.